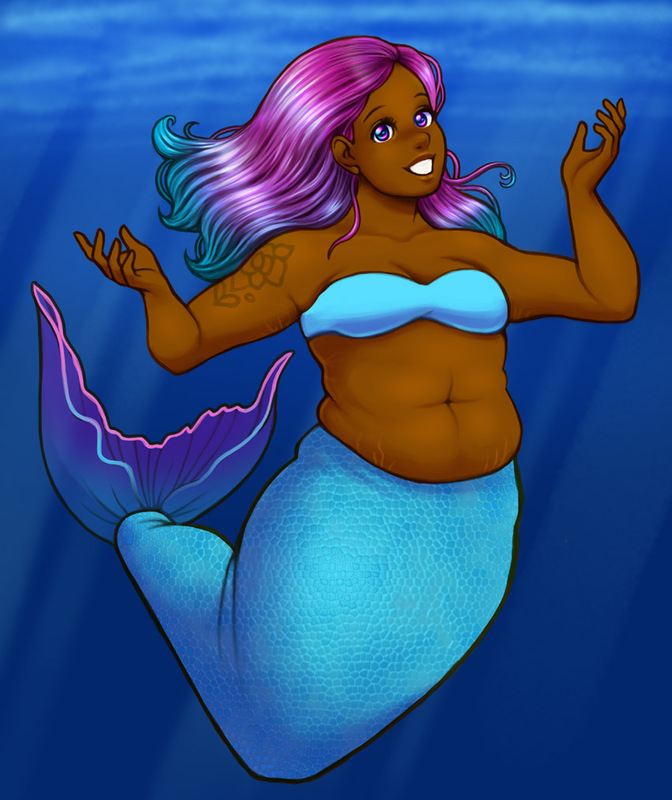 Mermaids come in a variety of shapes, sizes, and colors. 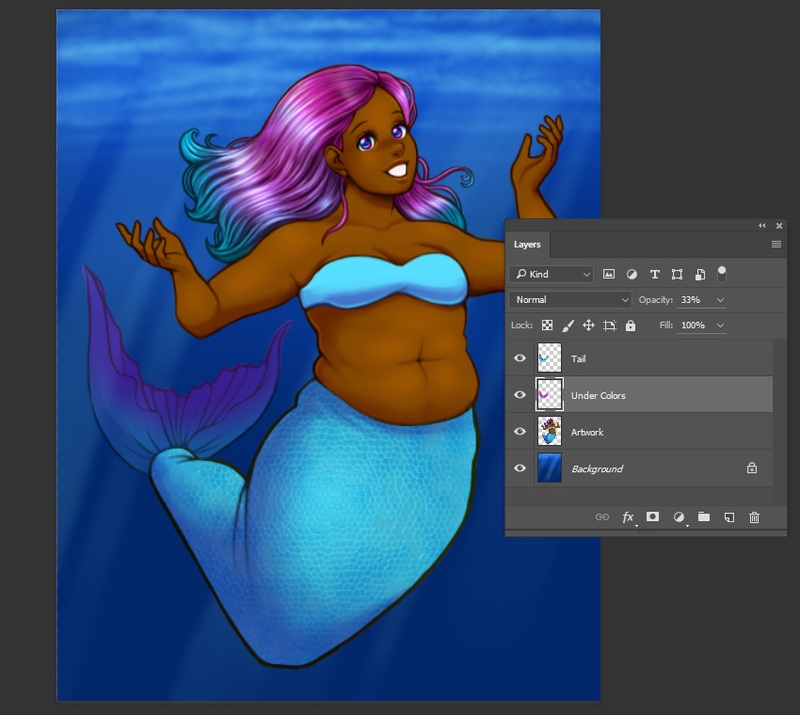 In this tutorial, we’ll walk through drawing and painting a colorful mermaid in Adobe Photoshop. 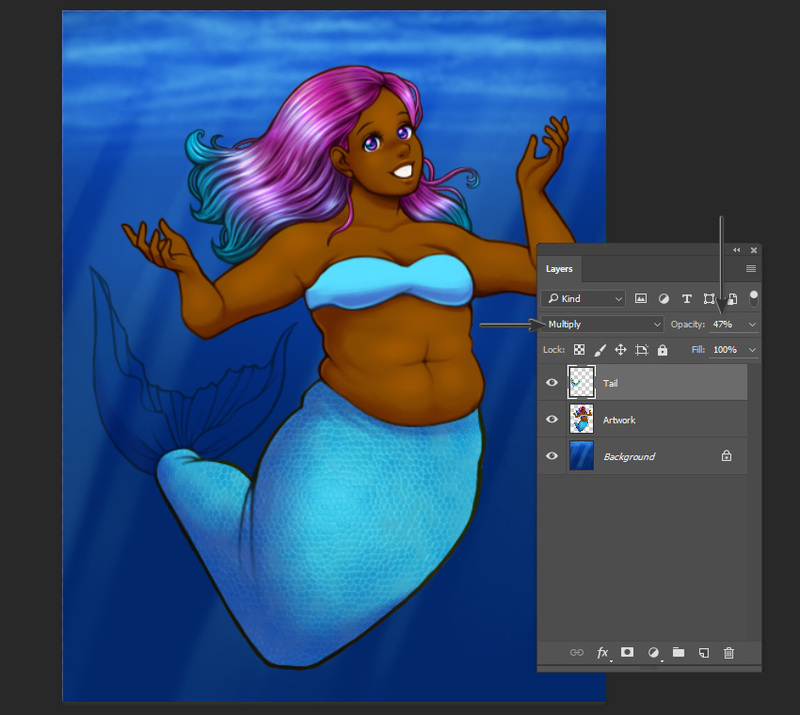 We’re going to both draw and paint within Adobe Photoshop, from start to finish—even the initial sketch. I assume that you have basic knowledge of Photoshop, such as creating new documents and selecting different tools within the Tools panel. You should have a basic understanding of layers, as well. Please note that this tutorial requires a drawing tablet of some kind, with pen sensitivity. We’ll start by creating a New Document. This can be found via File and then New. There are a lot of options here (enough for an entire tutorial on its own! ), but for the purpose of this tutorial, I’m going to draw at 8 inches wide by 10 inches tall. I’m also working at 300 dpi. Once you’re happy with your choices, select OK.
Before we start drawing, let’s make sure we’ve prepared our document properly. There are two important things I like to do before I begin sketching. Create a New Layer. 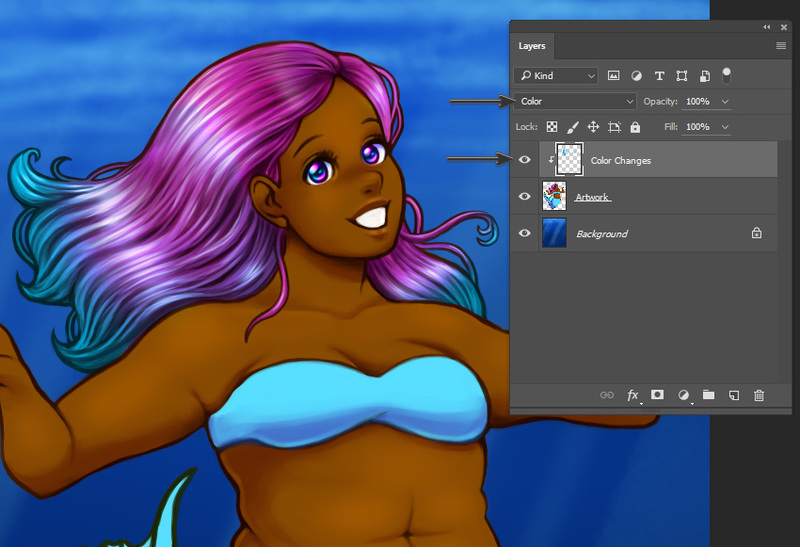 I use layers very frequently when I’m drawing and painting in Photoshop, and you’ll need them in this tutorial. To do this, make sure your Layers panel is open. If you don’t see it open by default, select Window and then Layers. By default, you’ll notice that there’s only one layer here. It’s called Background, and we could draw on it, if we wanted to. 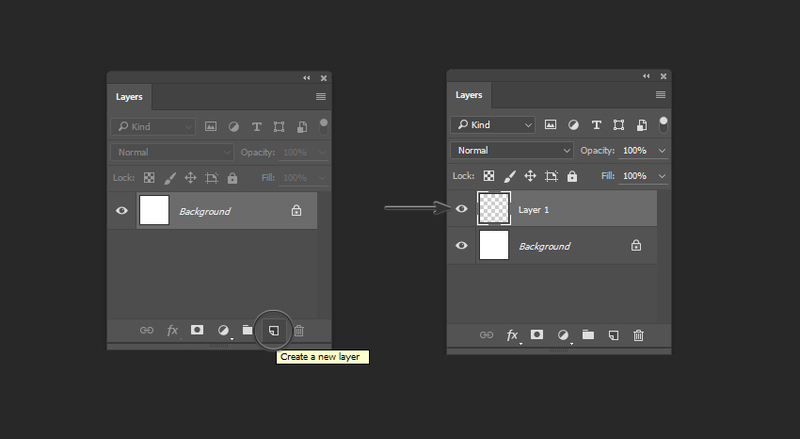 However, I’m going to make a new layer by clicking on the Create a New Layer icon. This new layer is the layer I’m going to draw on. This means it will be independent of the Background Layer (where the white, background color is located). Now, let’s choose a Brush to create our sketch. 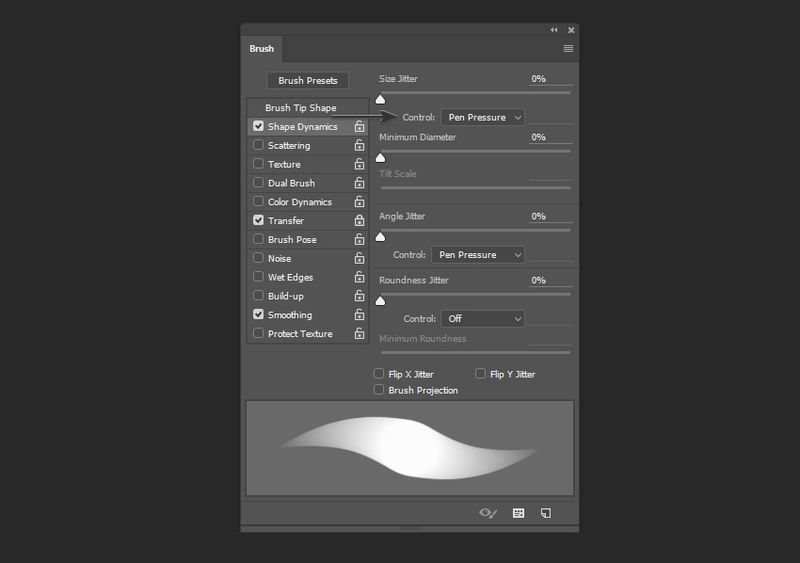 There are a lot of wonderful Photoshop brushes out there that you could use, but for this tutorial, we’re largely going to rely on the basic, default brushes included with the software. Note, these are just possible brush settings—there is no universally right or wrong choice, and the longer you use them, the more comfortable you will likely feel with them. However, the default settings might not look or feel the way you want them to, straight out the box. Maybe they lack the sensitivity you’re more accustomed to seeing in real media like pencils or markers, for example. We’ll make a few simple adjustments here that will change how they look and feel in use. You’ll notice in the preview that the ends of the brush taper off now, as opposed to staying at one uniform size. Again, this will be determined by the pressure you put on your pen. This may not be a setting that you want on throughout the entire painting process, but I recommend knowing where it is and what it does, especially for sketching. Now, let’s start drawing! I’m going to start with a basic Hard Round Brush. 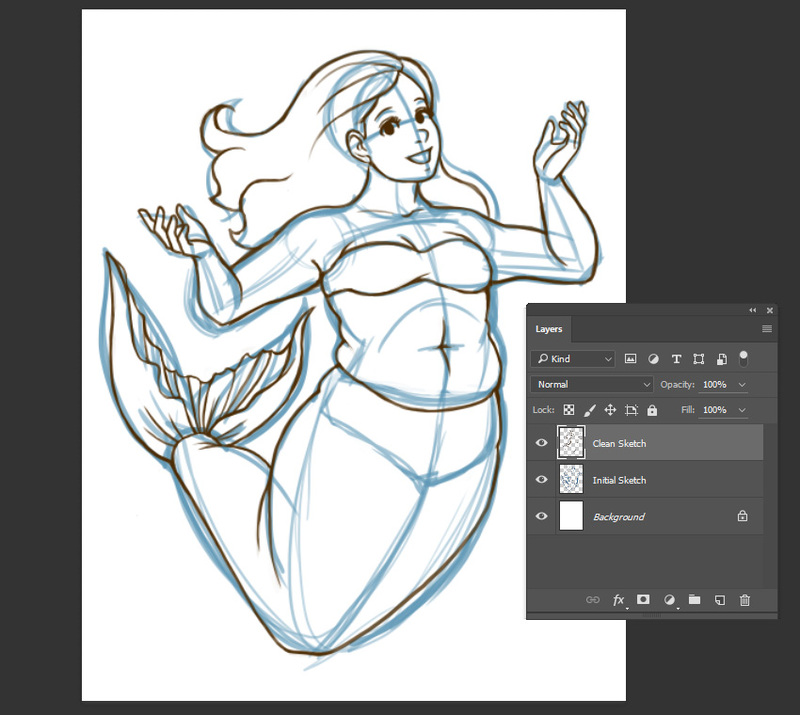 Since a mermaid is both a human and a fish, I like to look at references of both, so I get a look and feel for how the body of each moves. 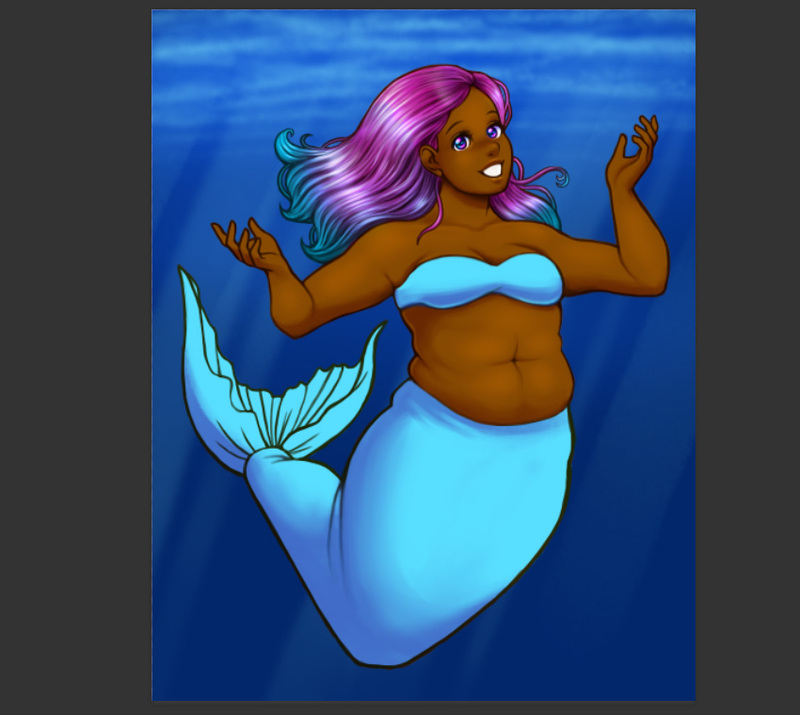 Don’t be afraid to experiment with body types, too! 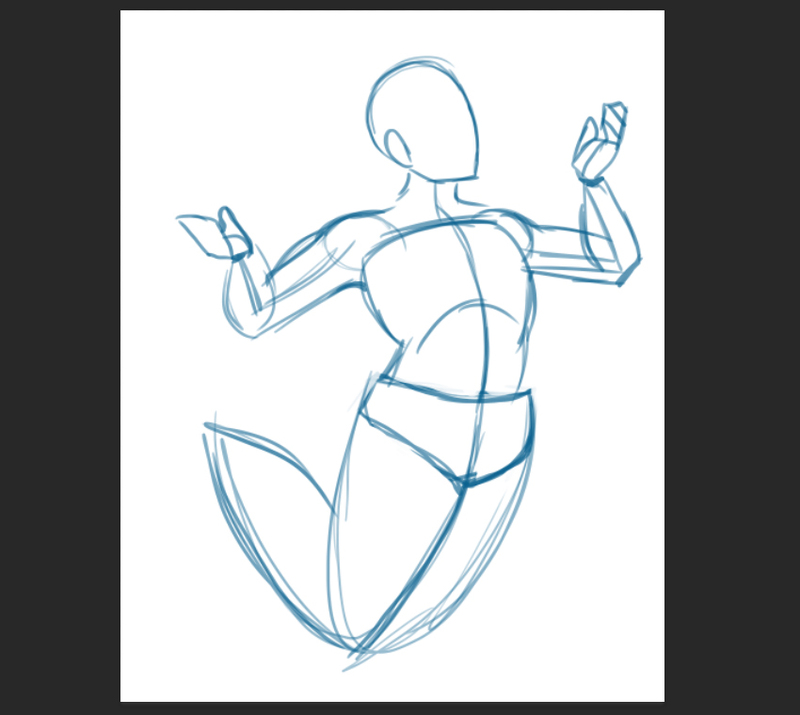 In this case, I’m going to give the character a full figure. I started by blocking out basic forms to define key parts of the body, such as the ribs and hip bones. When it comes to the tail, I chose to treat it as one long, flowing appendage. I’m going to pretend that there’s one long bone in there, for example. 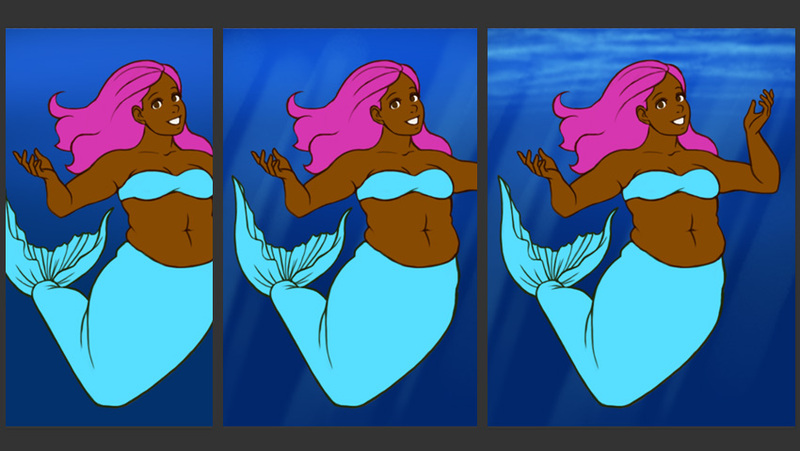 Since this mermaid is going to be underwater, let’s also consider how water might affect the character. 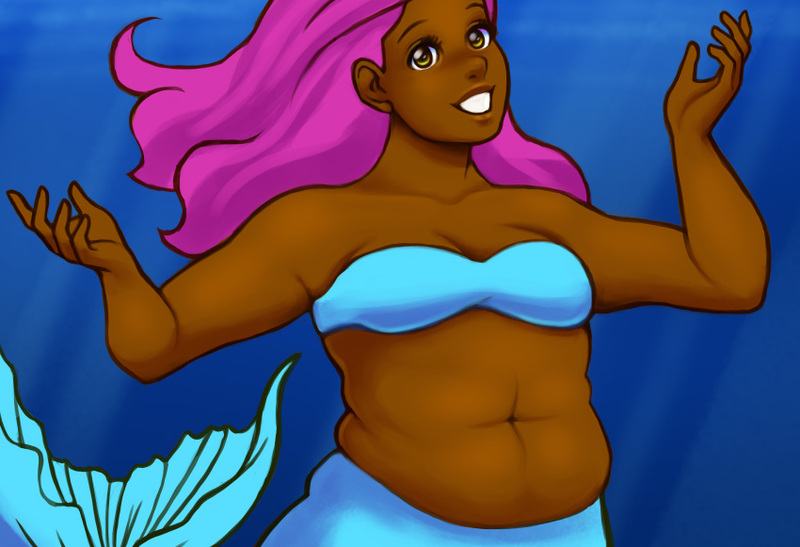 For example, the hair would likely flow with the water in some way, and the body’s weight might not be held in the same way as it would be on land. The tail, in this case, might also be flowy and light in weight. Now, let’s start working with colors! Personally, I like to paint on top of my lines. I start by creating a New Layer and setting the Blending Mode to Multiply. Then, I go ahead and paint on top. 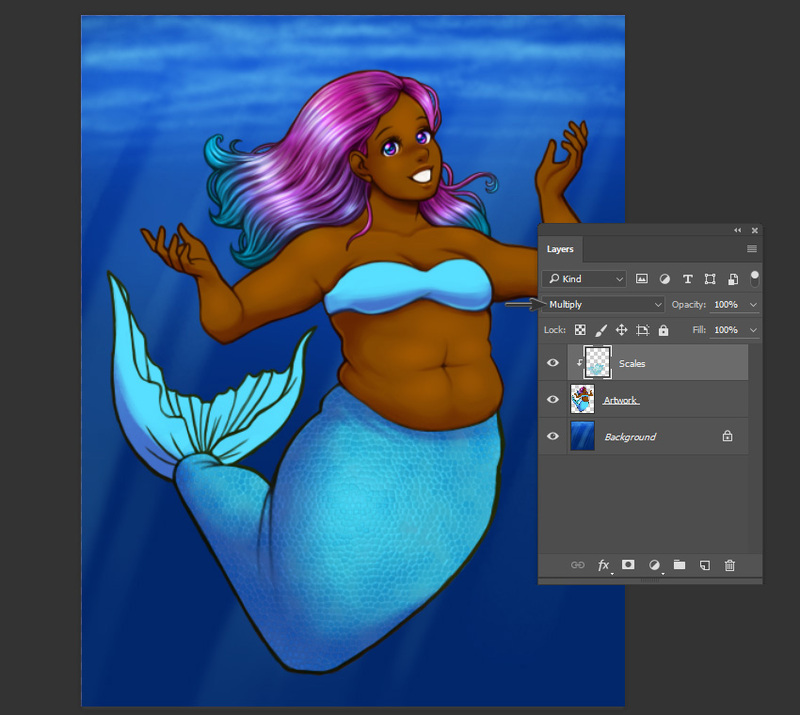 You’ll notice that this also alters the colors of my lines, based on the color I’ve placed on top. 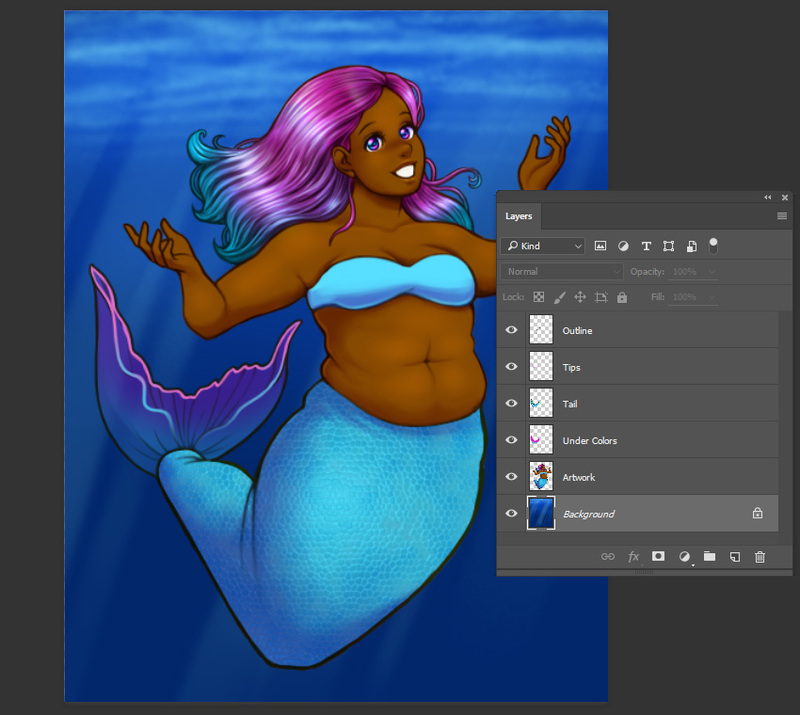 Once I’m happy with my choices, I like to Flatten my artwork layers. Warning, this means that the sketch and the colors will all be combined on one layer! I often like to Save a Copy of my work prior to doing this, just in case I want to go back, prior to this step! Now, let’s add a basic Background Color. 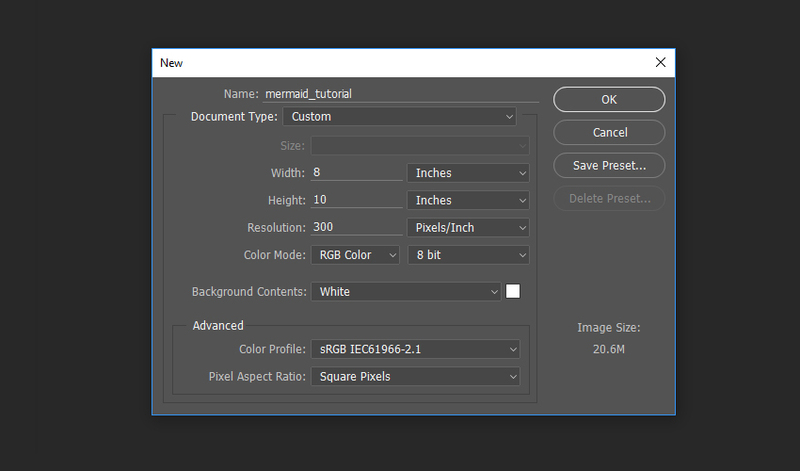 Choose a color via the Color Selector in the Tools panel, and then apply it to the Background Layer using the Paint Bucket Tool. If necessary, clean up any stray color around your artwork. Since I’m going to use the background to inspire the shadows on the character, I’m going to block in some basic background elements. 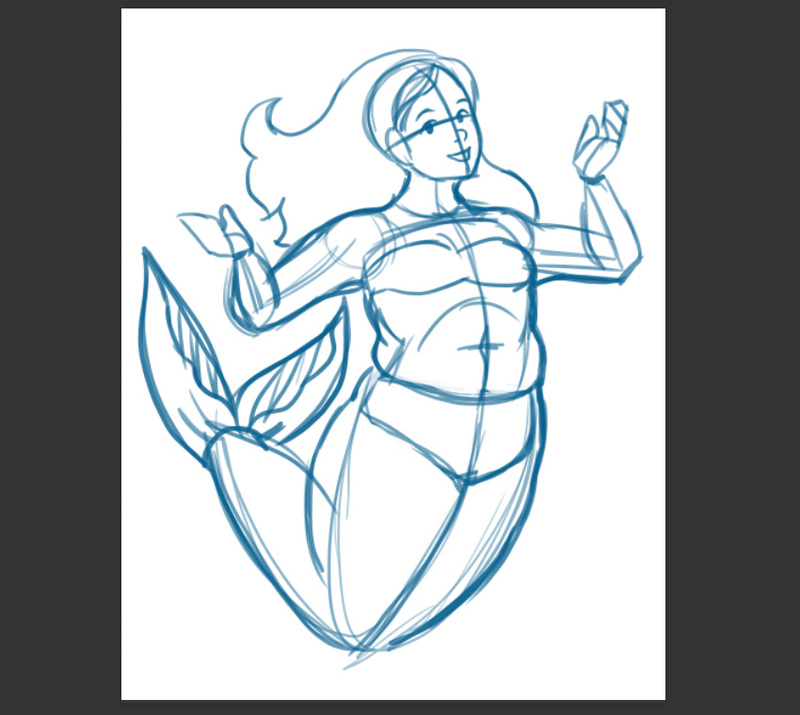 I know I want my mermaid to be underwater, and I’d like to have some light shining into the water, from above. 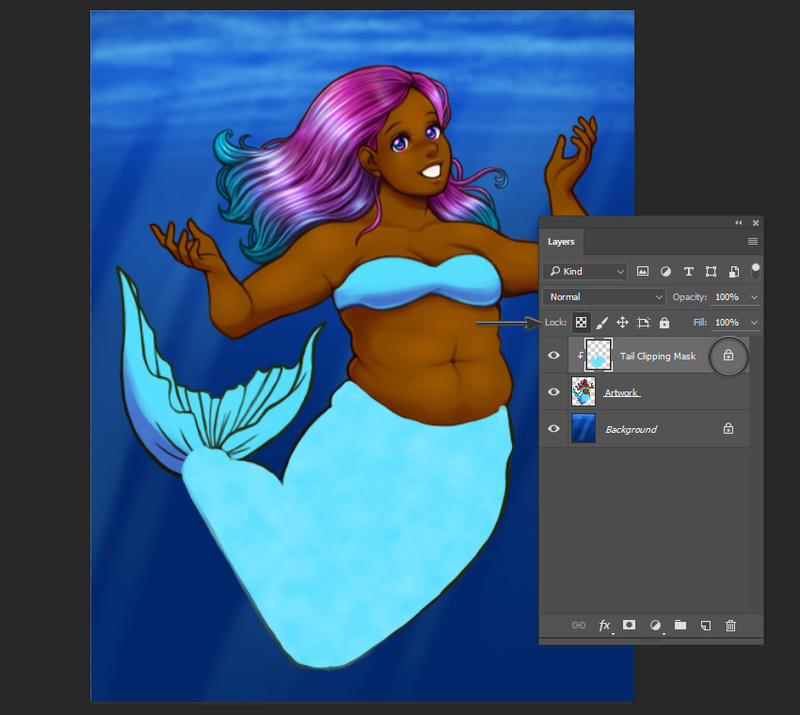 Here is what a Layer with a Clipping Mask applied looks like. Note that I’ve also set the Blending Mode to Multiply. Now that we’ve established the basics of our drawing, we can start refining our work. This is the point where I often experiment with other brushes. For example, when rendering skin, I often use a brush with a softer edge. I used the default Soft Round Brush for this tutorial, with the same settings reviewed earlier, to make the shadows look softer on the skin. Experimenting with the Opacity (the amount of transparency) and the Flow (how much “paint” comes out) can help in areas that require subtle changes in value. This may vary depending on the amount of pressure you put down on your pen, stylistic choices, and how you prefer to draw. I also like to add variation in the hair, so it doesn’t necessarily look like one uniform block. I experimented with placing stray strands on top, in a new layer, in a similar color. To unify them with the rest of the hair, I added contours in a dark color on the outermost edges. To achieve more than one color in the hair, I created a New Layer on top of the hair. I used a Clipping Mask, once again, so I don’t have to worry about coloring “outside of the lines”. I changed the Blending Mode to Color, and voila! Now the tips are blue! You’ll notice that I also used this opportunity to add a touch of color to the eyes. I used a Soft Round Brush to add in some pinks and blues, again, with the same technique. 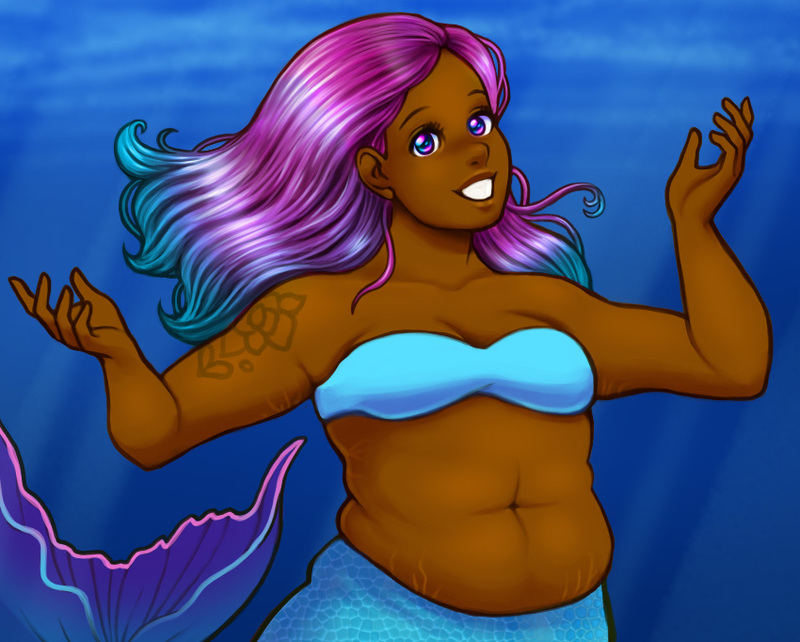 Usually, a mermaid’s tail differs from human skin. 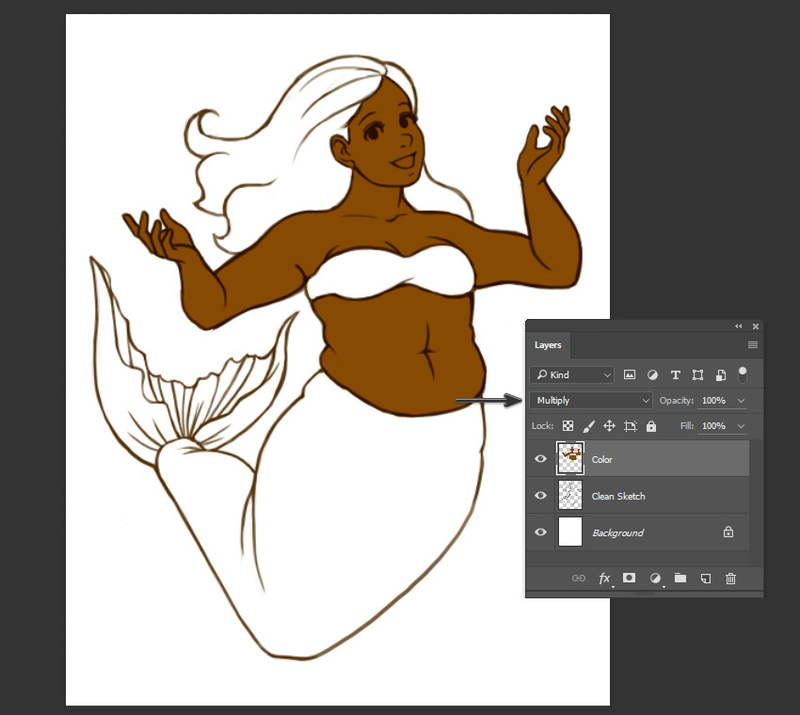 We might expect this part of the mermaid to have a scale-like texture, like we’d see on a fish. Before I start to experiment with textures, however, I want to go through and blend the shadows I’ve placed in this area, using a Soft Round Brush and lowered Opacity. Once you’re happy with your base shadows here, it’s time to start experimenting with texture. 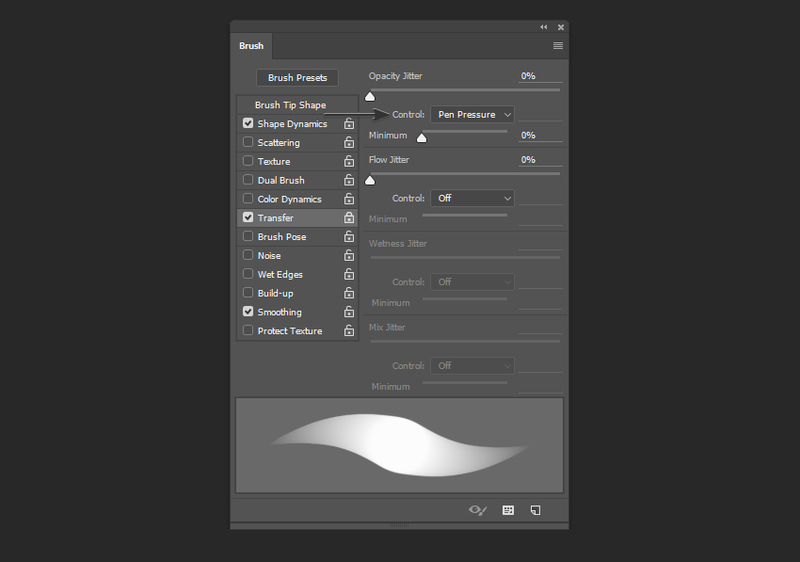 We’re going to create a texture ourselves, here in Photoshop, to create a scale-like effect. 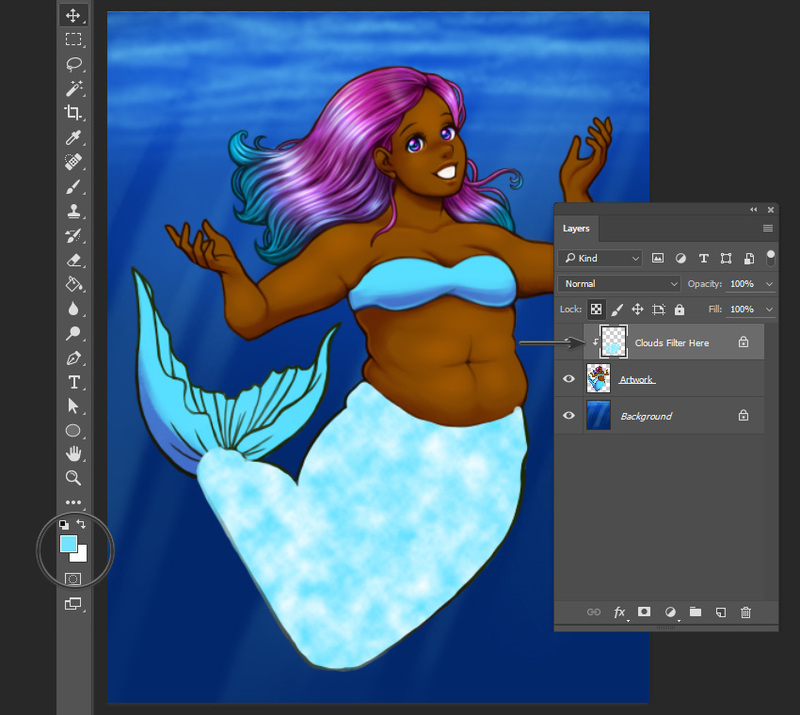 First, much like how we changed the hair color, we’ll start by creating a New Layer on top of our artwork. Block out the area in a single color, but don’t change any blending modes this time (just leave it Normal for now). This means that when we move on to apply filters, it will stay isolated in this area we’ve filled in. First, we’ll apply the filter Clouds to create some variation in value. Alternatively, you could add your own variations here, by hand. Now, let’s create some scales! Open up the Filter Gallery, via Filters > Filter Gallery. Keep in mind, however, that there are no “perfect settings”. I would encourage you to experiment and adjust these values, as you see fit. Select OK once you’re happy with the values you’ve selected. 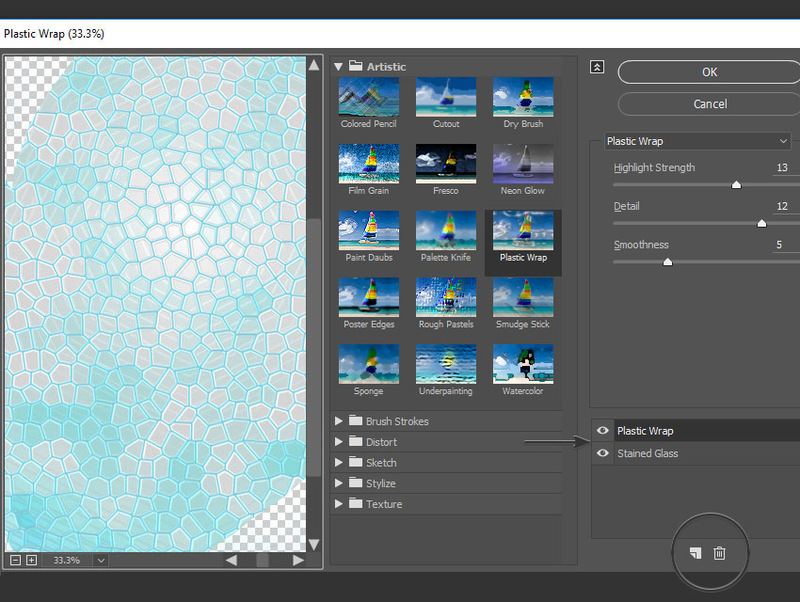 Now, set the Blending Mode of the layer we’ve been working on to Multiply. Voila! Our mermaid’s tail looks as if it’s covered in scales. 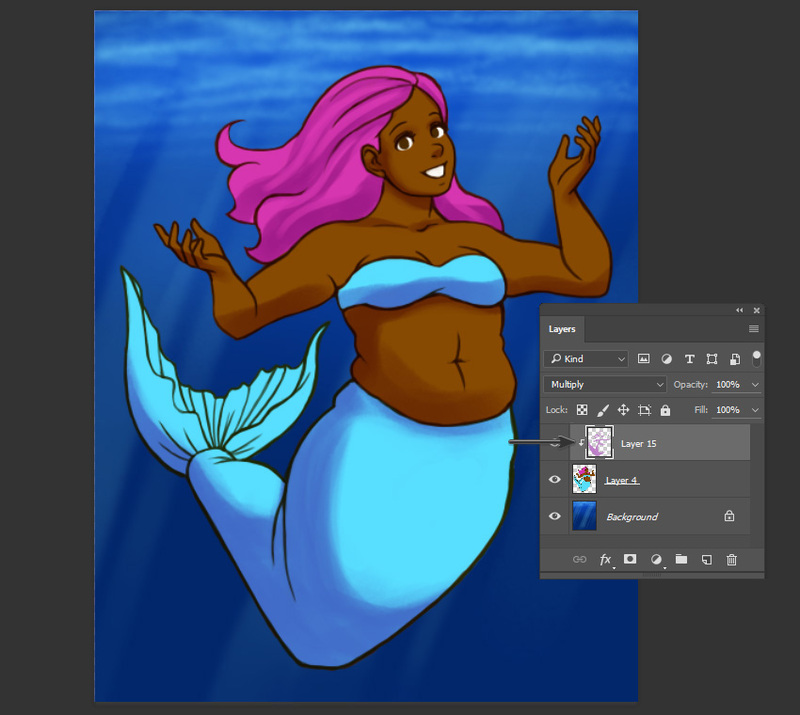 To finish up our illustration, we’ll add some details to the tail fin and the character’s skin. 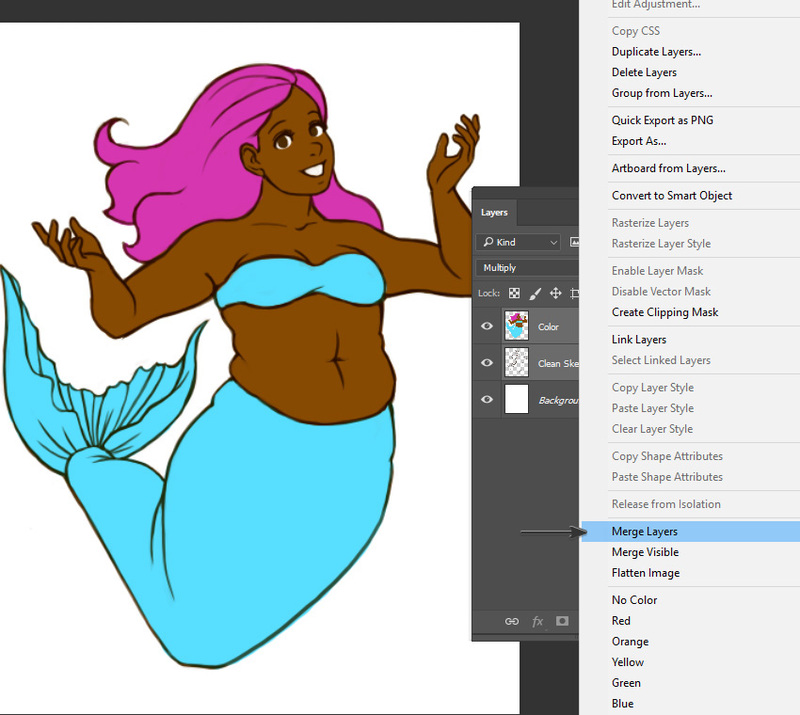 First, cut the mermaid’s tail and paste it onto its own layer. To finalize the tail, I used more than one layer. I drew the lightly colored tips of the tail with a Hard Round Brush with the Opacity all the way up (100%, meaning it is not transparent). 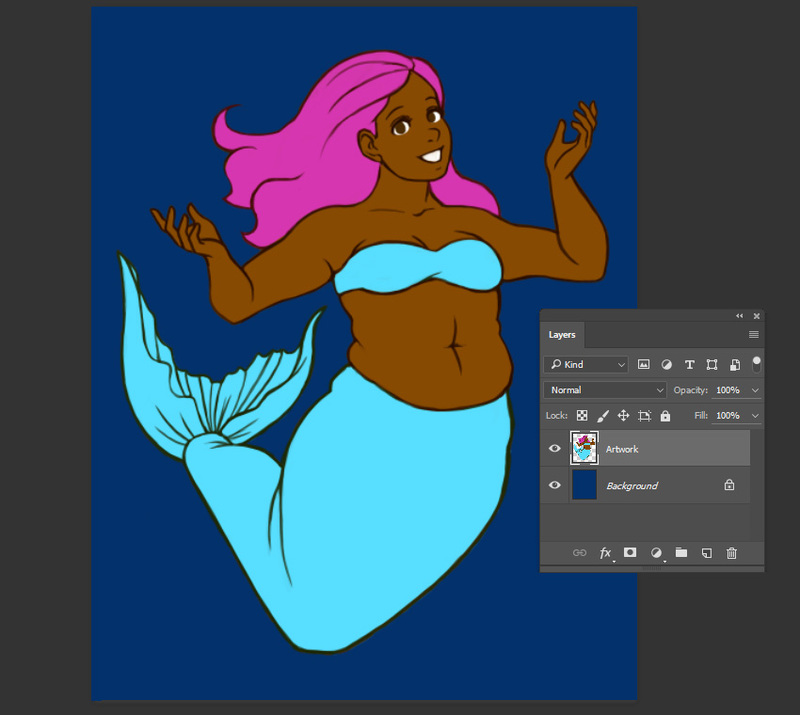 Remember, you can always toggle Lock Transparent Pixels on and off, if you’d like to apply color without it going outside the boundary of your drawing. I used this, here, to change the color of this line from purple to blue. I hope you’ve picked up some new tips and techniques in this tutorial. Please keep in mind that these steps can (and should!) be experimented with—try different colors! Try different poses, body types, and even different types of tails!